Most diving suits are ambient pressure (“soft”) suits that protect their wearers from the cold and surrounding environment, but not from the pressure of the water. At extreme depths, an atmospheric pressure (“hard”) suit maintains surface pressure internally, insulating its operator from environmental pressures and eliminating the need for decompression after a dive. These atmospheric diving suits (ADS) function as one-man submersibles that possess articulated joints to allow their operators to move and interact with the surrounding environment. ADS were originally created for commercial reasons — initially for salvage and underwater construction work, and later for use in the oil industry. The JIM suit was developed in the 1960s by Mike Humphrey and Mike Barrow of the British commercial firm Underwater Marine Equipment Limited (UMEL). In the late eighteenth and early nineteenth centuries, other inventors had made partially successful attempts at developing a commercially useful ADS, but interest dwindled as their limitations became apparent. Humphrey and Barrow strove to improve the ADS at a time when the oil industry began working at depths greater than human divers in ambient pressure suits could work. The starting point for the design of the JIM suit was an ADS created by inventor Joseph Peress in the 1930s. Peress’s suit, Tritonia, was cast from magnesium alloy and employed spherical, fluid-filled joints. Diver Jim Jarret tested Tritonia for Peress, taking the suit to 477 feet during its first test dive. Five years later, Jarret famously used Tritonia to dive the wreck of RMS Lusitania. Peress retired the suit in 1937 after the British Navy declined to purchase it. Three decades later, Humphrey and Barrow tracked down Joseph Peress and managed to locate Tritonia in an old junk shop in Glasgow, Scotland. Peress helped refurbish the old suit and UMEL used it to secure funding in the form of a research grant from the British government. Two JIM suit prototypes — named for original Tritonia diver Jim Jarret — were built and tested in secrecy aboard HMS Reclaim in the early 1970s. These open-sea dives were carried out to 442 feet (limited by the ambient pressure suits of the support divers); after additional testing and development, Humphrey was able to take JIM to 1,000 feet in 1974. These successful test dives drew the attention of Oceaneering International, one of the world’s largest commercial diving firms. In 1975 they bought the exclusive rights to the JIM suit, effectively prohibiting other companies from developing ADS technology. Early JIM suits were rated to 1,000, 1,250, and 1,500-foot depths and were constructed of magnesium alloy. In 1976, Oceaneering International employee Walt Thompson set a record with a JIM suit for the longest working dive below 490 feet: five hours and 59 minutes at 905 feet. 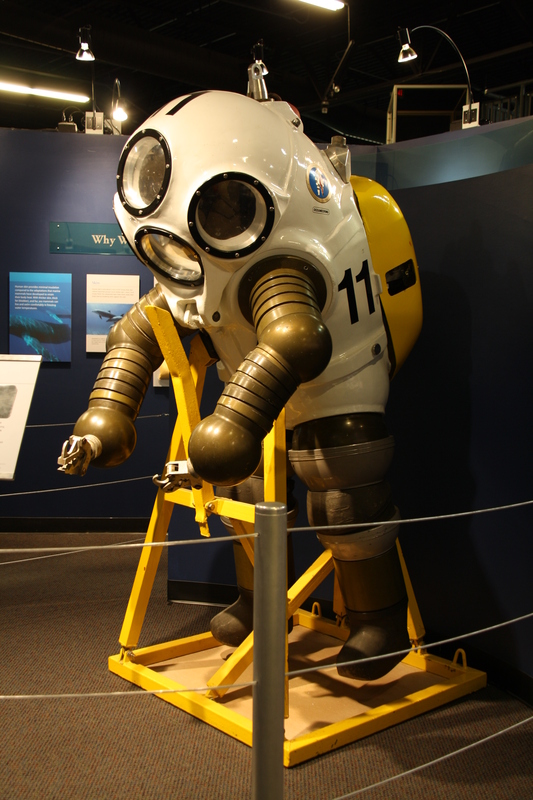 Oceaneering International also built variations of the JIM suit. The JAM suit was simply a JIM suit whose magnesium torso had been replaced with glass-reinforced plastic (GRP). The SAM suit was a lightweight, more anthropomorphic version of JIM made of aluminum or fiberglass. The U.S. Navy tested the JIM suit in 1975, investigating its capabilities for two weeks at the Navy Experimental Diving Unit in Panama City, Florida. It determined that ADS like JIM were viable underwater tools for salvage work and submarine rescue missions. The Navy’s experiments with JIM spurred the development of all future Navy ADS, including today’s Hardsuit 2000.